I'm still working my way through all my Cosmoprof footage which includes items from the 2016 Cocktails and Colors indie event. 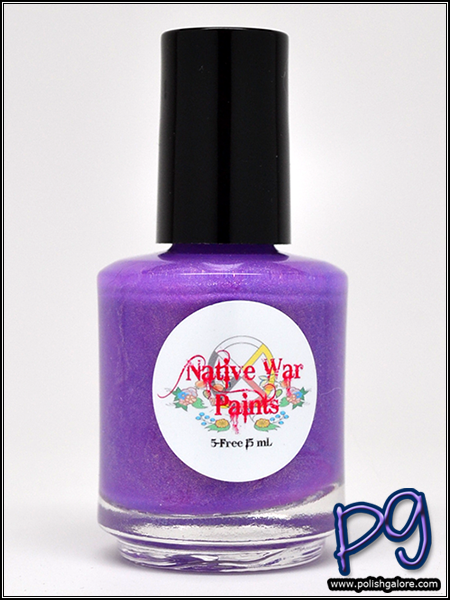 While there, I chatted a little with the owners of Native War Paints. This husband and wife duo were HILARIOUS. As we were winding down the night, Mr. NWP pointed to the display of polishes and said "Take one." It was like the angels were singing. I immediately went for a purple... which I was wearing a purple shirt with purple nail polish on and oh yes, my purple hair. If you have any doubt if I like purple... What I couldn't tell at the time is that this beauty, aptly named Shy Violet has a gorgeous gold shimmer running through it. I used a base coat of Duri Rejuvacote, 2 coats of polish and finished with Digital Nails Ain't Nobody Got Time For That top coat. The formula was very nice - I was worried at first because the shimmer almost had a pearl-like effect with the first coat and I was afraid this would be a brush stroke mess. Instead, the second coat and drying erased the look of any brush strokes which was great come top coat time. Being a neon, this does dry matte and top coat brings out the best in the shimmer. Additionally, this polish is from the Mrs. White Neon Brites and so I'm told that they watermarble beautifully. I absolutely love this color. Now you can just barely see some VNL on a few nails but for the most part, it's opaque. In person, the shimmer hides any VNL so I'm a happy camper. I feel like I've had some crazy nails lately but the purple makes me smile. Native War Paints may be purchased through their website. Join the conversation on social media on Facebook, Instagram and Twitter. Use #nativewarpaints to find other fans!